We all have our favorite dishes, and those we wish we could make. 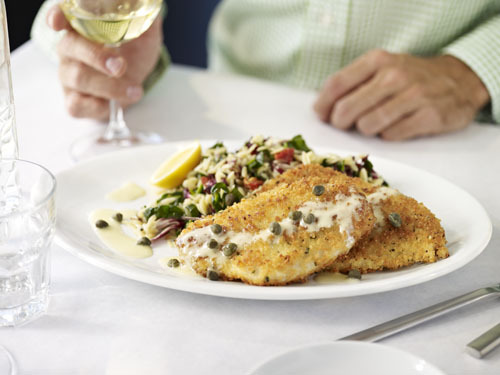 Mine just happens to be the Parmesan Crusted Sole from Romanos Macaroni Grill. However, I do not enjoy paying $18.75 for one dish, so I found the secret to serving four the same delicious, and healthier meal, for the same price. In a food processor blend panko, parmesan and parsley until fine. Transfer to a shallow pan. In a separate pan whip eggs and milk until well combined. In a third pan place the flour. Take the sole fillets and season with salt, pepper and powdered garlic. Dredge sole in flour, then egg wash and finally in the parmesan/panko mix. Pat the parmesan and panko into the sole until the mix sticks to the fish. In a large saute pan heat butter and olive oil until hot. Carefully place sole in the pan and shake the pan to make sure the fish doesn’t stick. When sole is golden brown, flip over and continue to cook. When sole is done (120° F internally), transfer to plate and top with lemon beurre blanc. In a sauce pan over medium high heat, combine wine, vinegar and shallots. Reduce until almost a syrup consistency. Add cream and continue to cook reducing by half. Turn the heat to low and add butter cubes 2 at a time while stirring until all the butter is added and sauce is a creamy consistency. Season with salt and pepper. Note: If the butter is not chilled it will not incorporate into the sauce. Also if the wine mixture is not reduced far enough the sauce will be runny. Cook orzo according to directions on box, about 9 minutes or until al dente. Heat the olive oil on medium heat. Add garlic and stir, making sure to not let the garlic brown. Add the zest and lemon juice. Toss in the spinach and radicchio and cook until just wilted. Remove from heat and add orzo. Mix. Sprinkle with cheese once it is on the plate.